Selective Black, silicone-based paint which collects heat more efficiently than ordinary black paint and resists out gassing to 400F. (Covers 7-8 sqft per can) It is designed to selectively absorb wavelengths with the greatest heat content when used on the metal surfaces of collector panels having glazed covers. It collects heat energy more efficiently than ordinary black paints which emit a significant amount of the energy they absorb. 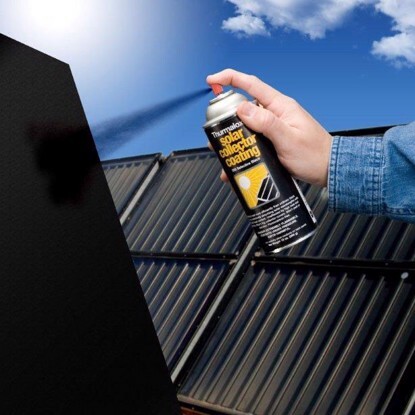 1 quart can - Selective Black, silicone-based paint which collects heat more efficiently than ordinary black paint and resists out gassing to 400F. (Covers 20-25 sqft per can) It is designed to selectively absorb wavelengths with the greatest heat content when used on the metal surfaces of collector panels having glazed covers. It collects heat energy more efficiently than ordinary black paints which emit a significant amount of the energy they absorb.